Lou Bendrick takes a good look at conventional popcorn - mostly the microwave stuff since that's what most people eat - and it's not pretty. (I've posted a photo of the popcorn I grow to balance out the ugliness with some of the grains natural beauty. Refresh yourself as needed.) The grain is most likely genetically modified and not grown organically (unless it otherwise states), the butter flavoring might taste good but is undoubtedly not good for you, and the packaging is not good for the planet. I grow my own organic popcorn using a combination of seeds - Tom Thumb, a small yellow variety; Strawberry, a small red variety that can often also be found at Farmer's Markets for eating or decorating; and Thanksgiving, an heirloom brown variety offered by Project Grow that gives up good size cobs with caramel-colored seeds. If we weren't moving to Japan, I'd add Blue to my list to see what happens. 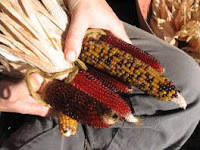 I consistently get a good harvest, and the cobs are a jaw-dropping mix of colors. Once I can't dent the kernals with my fingernail the cobs are ready for harvest. I pull back the dried husk, but leave it attached. I remove the silk, and then bunch the ears for hanging. (The husk is helpful for this process.) I let them hang until they are dry or I remember that I need to finish that project. I get about two to three quarts of popcorn (dried and de-cobbed) per year. Hey Joan - let's give a shoutout to the Clinton Theater that pops up Eden's organic popcorn for righteous movie munching!It's a family theater in downtown Clinton where the price is right ($3.00)and the pre-movie music is the coolest in the county (served up by theater owner Frank Allison from his vast and quirky audio library). I'm so sorry about the beans, Diana! I remember running out of the house one year when I spotted a ground hog in the garden. I threw my slipper at it, but it wasn't until I stationed my grandmother's dog nearby that they finally vacated. I'm glad the popcorn worked out, though!